It is a quiet day at the office today. Our boss went to another branch to interview applicants sent by the employment agency. That is an old branch but it has been revamp since the branch manager retired at the beginning of this year. They need seasonal drivers that will service the Philadelphia area. I do not know what made my boss went down there to personally meet the applicants. He has not done this with the previous ones. Some of these temp hires get lucky when they are eventually absorbed by the company they work with. Our receptionist for one, she got a permanent position after working for six months with the temp. My boss liked her performance so he offered her the job. She was so happy because she is a working student and at my job, they are more flexible with your hours when you have to do something for school. Everybody is aware that she is not staying for good. Once she is done with school, she will be looking for a job in line with the course she is taking. As long as she gives sufficient time for us to get a replacement, it is fine. 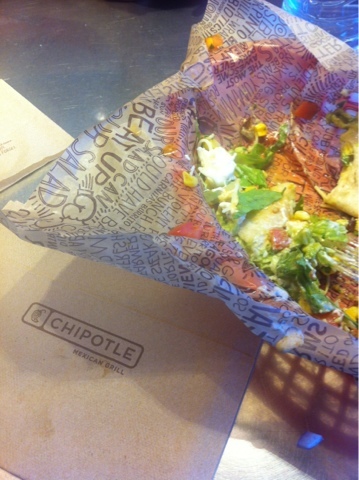 It was our first time to try Chipotle until one day a new branch was opened nearby. We stopped by and tried it. And, we really really like it. The set up is not new because we frequent Qdoba and another Mexican restaurant which I cannot remember the name right now. I ordered the burrito bowl which filled me up, hubby had the chicken quesadilla and daughter one of the kids meals. Now we know why a lot of people go to chipotle. We are one of them now.